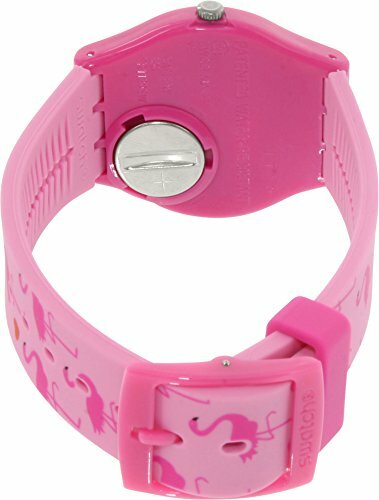 Pink plastic case with a pink silicone strap. Fixed translucent pink plastic bezel. 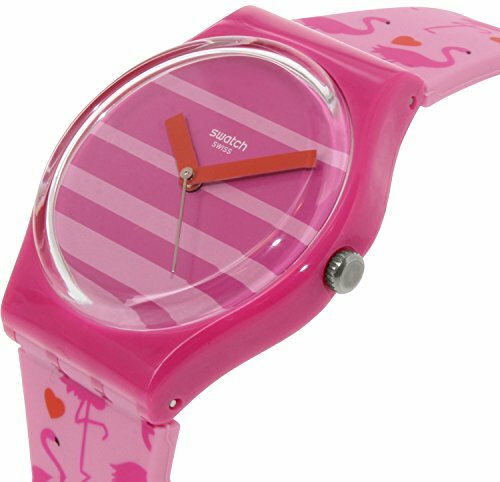 Pink stripe dial with red hands. No markers. Dial Type: Analog. Quartz movement. Scratch resistant mineral crystal. Pull / push crown. Solid case back. Case diameter: 34 mm. Case thickness: 8.75 mm. Round case shape. Band width: 15 mm. Band length: 7 inches. Tang clasp. Water resistant at 30 meters / 100 feet. Functions: hour, minute, second. Casual watch style. 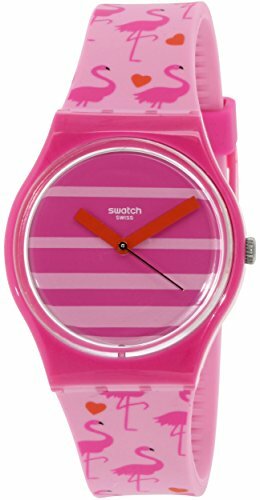 Swatch Miami Peach Pink Stripe Dial Pink Silicone Unisex Watch GP144.